An example of an experimental overshot flake removal produced by Metin Eren (image from Eren et al. 2013). Eren, M.I., Patten, R.J., O’Brien, M.J., Meltzer, D.J., 2013. Refuting the technological cornerstone of the Ice-Age Atlantic crossing hypothesis. Journal of Archaeological Science 40, 2934-2941. Eren et al’s results suggest that overshot flakes are by products of a general biface thinning technique and in and of themselves are not very reliable or optimal at thinning bifaces. 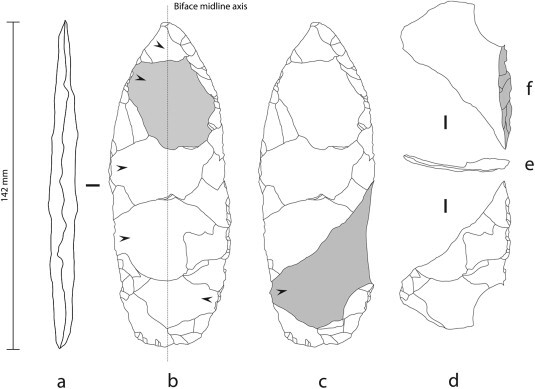 This conclusion seems to suggest that Solutrean and Clovis bifaces were produced using similar, simple, biface thinning techniques that resulted in occasional, accidental, overshot flakes. The article also contains a discussion of the existing archaeological evidence for overshot flaking in Clovis assemblages, not much, and the lack of comparable data in Solutrean assemblages. Lohse, J.C., Collins, M.B., Bradley, B., 2014. Controlled overshot flaking: a response to Eren, Patten, O’Brien, and Meltzer. Lithic Technology 39, 46-54. Eren, M.I., Patten, R.J., O’Brien, M.J., Meltzer, D.J., 2014. More on the rumour of “intentional overshot flaking” and the purported Ice-Age Atlantic crossing. Lithic Technology 39, 55-63. 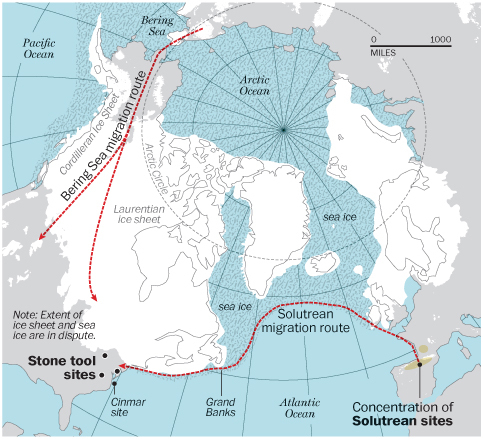 It is unlikely that these papers will mark the end of the Ice-Age Atlantic crossing hypothesis, but they have at least brought the role of stone tools in the debate somewhat closer to scientific scrutiny. This entry was posted in Paper Discussion Forum and tagged archaeology, clovis, experiments, ice-age, lithics, solutrean, stone age by Justin Pargeter. Bookmark the permalink. in my experience intentional overshot flakes are very effective in rapidly thinning the hell out of a chunk of rock. The overshot flakes take a bite out of the opposite margin in a way that consistently produces a parallel sided biface that is more typical of Clovis forms rather than the pentagonal silhouettes of Solutrian bifaces. .